Jindrisska Tower (Jindrisska Vez) in Prague dates from the late Gothic era. It was constructed in 1472–1476, although has had several rebuilds and alterations since. Following a major fire in 1745, Jindrisska was rebuilt in the Baroque style. Then, in the 1870s it was reconverted back to the Gothic style by the famous architect Mocker. Finally, in 2002 extensive reconstruction transformed Jindrisska into a wonderful multi-level attraction. 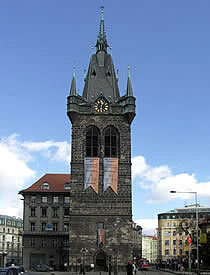 Jindrisska is the highest separate belfry in Prague at 66m high and now has ten floors. At the top, visitors can enjoy a panoramic view of Prague's city centre, including the close by Wenceslas Square and National Museum, but also as far a field as Prague Castle. On the 6th floor is an exhibition of Prague towers and a souvenir shop. On the 7th and 8th floors is a unique dining experience - a restaurant set in the original wooden trusts of the belfry. On the 1st floor, stop for refreshments in the coffee shop. Although located just off Wenceslas Square, Jindrisska Tower is not on the regular tourist circuit, so can be wonderfully peaceful. You may even have the viewing turrets all to yourself. A lift offers easy access to all levels. Prague All Inclusive Walking Tour & Boat.